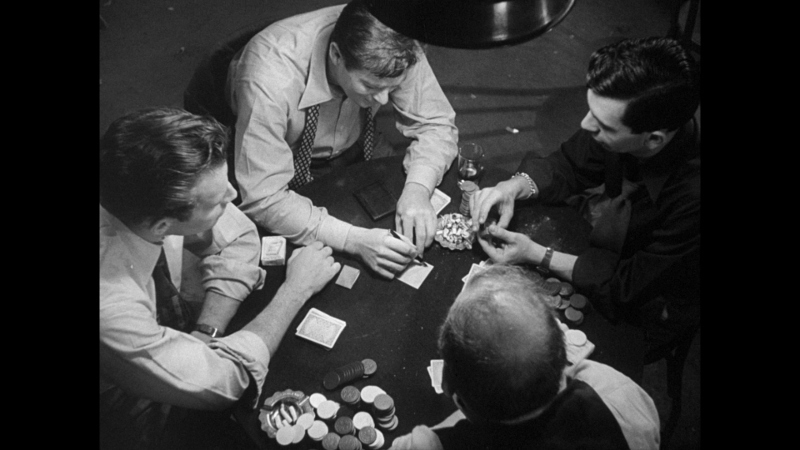 The setup is simple: a group of hustlers, unofficially led by Danny Haley (Charlton Heston, in his professional film debut), cheat hopeful young Arthur Winant (Don DeFore) out of a $5,000 cashier's check. Unfortunately, the money was never exactly Arthur's to begin with: he was using it to start a business back in Los Angeles, and the loss drives him to hang himself later that night. 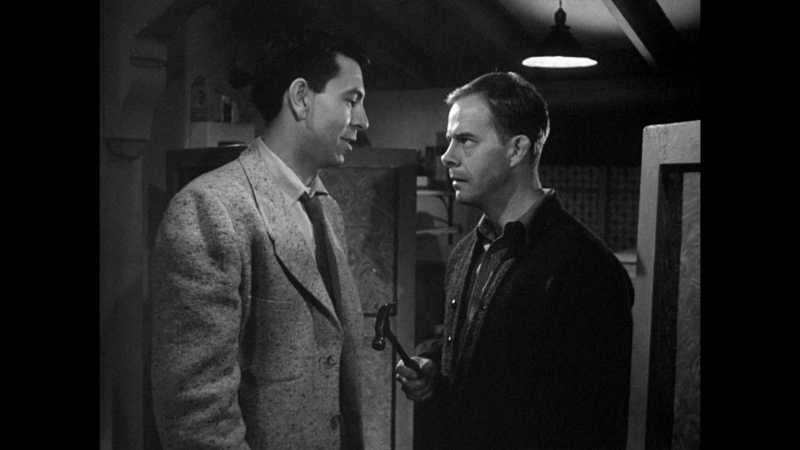 The police quickly sniff out Danny and his men, including immature Augie (Jack Webb), ex-boxer Soldier (Harry Morgan, credited as "Henry"), and worrywort Barney (Ed Begley)...but the check hasn't been cashed yet, so there's not much in the way of evidence. Soldier, who wasn't directly involved in the crime, leaves town in disgust. The other three stay local, hoping the investigation will blow over during the next few days. Of course it doesn't, not by a long shot. 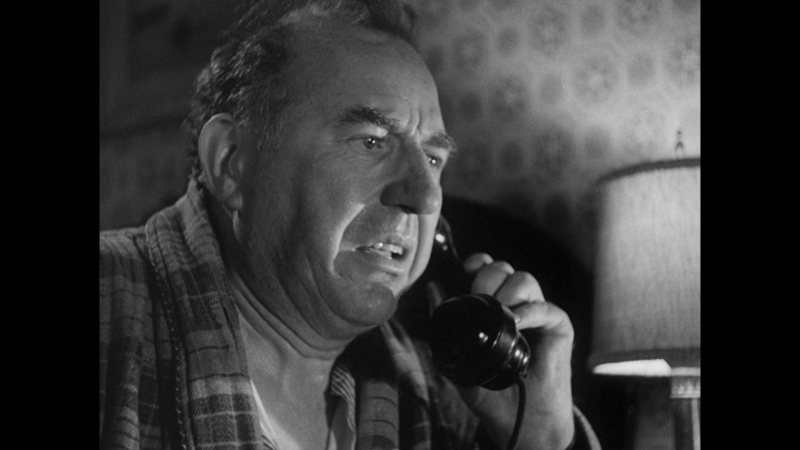 But Danny, Augie, and Barney aren't worried about the police as much as Sidney Vincent (Mike Mazurki), Arthur's vengeful older brother who, during the course of the film, is spoken about in hushed tones and regarded as a violent man of Paul Bunyan-like stature. Little is known about Sidney aside from his violent reputation. We don't even see his face during the silent pursuit of Arthur's unofficial killers, just a large hand sporting a distinctive black ring. As Sidney closes in on the group, the terrible stories about him can be seen on their faces; even tough-guy Augie looks trapped in his own city. But none take it harder than Barney: combined with his guilt about the crooked card game and stomach ulcers, it's obvious he won't be around for very long. 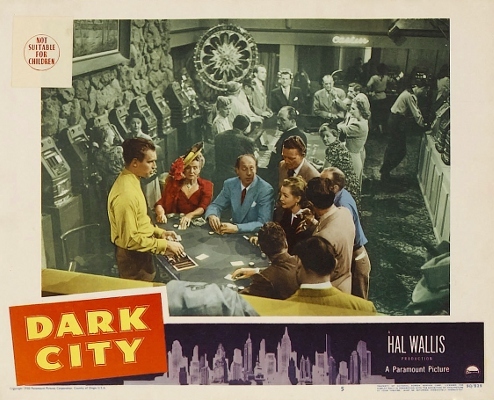 The suspense created during Sidney's pursuit of Danny and his crew is what drives William Dieterle's Dark City (1950); its potent, gnawing combination of suspense, terror, guilt, and mystery isn't far removed from modern classics like No Country for Old Men. In fact, had this aspect of Dark City been amplified even further, it'd be a genuine genre classic. Unfortunately, it's tied down with not one but two romantic subplots that cripple the film's momentum: the first revolves around nightclub singer Fran Garland (Lizabeth Scott) and her tireless pursuit of the sporadically interested Danny. The second occurs in Los Angeles with Arthur's widow Victoria (Viveca Lindfors), who Danny tracks down using a false identity to learn more about Sidney. Both women let in the charming but deceptive Danny too early and too often, but the real offense is that their scenes just distract from the much more interesting nightmare that Danny and his men have gotten themselves into. So when it's not shooting itself in the foot, Dark City is a captivating thriller that grabs tightly and doesn't let go. But even at a relatively brisk 99 minutes, it seems a little bloated. Olive Films first released Dark City on DVD back in 2010; two years later, it made the jump to Blu-ray as part of the studio's Film Noir Collection boxed set. Like both previous discs, this release contains no extras and a competent but hardly pristine A/V presentation. Most of the flaws appear to be source related, however, so I'd imagine anyone who's seen Dark City will appreciate the mild improvements that this 1080p transfer brings to the table. Those who already own Dark City on DVD should be pleased with the film's appearance on Blu-ray, largely because they'll be much more familiar with its specific strengths and shortcomings. Let me be perfectly honest: this isn't a night-and-day difference in many respects, but the bump to 1080p does reveal some fantastic textures and terrific close-up details, while film grain and background depth also look much more natural. But there are plenty of source material problems on display here, including stray amounts of dirt and debris, sporadic moments of softness, persistent flickering (especially during dark scenes), occasional contrast and brightness issues, as well as a warped section of film that occurs around the one-hour mark and lasts for roughly 10 minutes, giving the picture a temporary "wiggly" appearance. Again, these flaws occurred on the DVD as well...and while this film would have benefitted from a more thorough restoration, I'd imagine that some problems were unavoidable...but either way, this is the best that Dark City has ever looked on home video. Die-hard fans will be glad to see any improvements, even minor ones. The audio is also rough around the edges, though purists should be pleased with this DTS-HD 1.0 Master Audio track. Dialogue is relatively crisp and clear (save for the occasional muffled line), but there's a persistent hiss during the bulk of this film that can be a little distracting on occasion. Music cues, from nightclub song breaks to Franz Waxman's original score, sound fairly thin overall and occasionally fight for attention. While I had very little trouble understanding the film's era-specific dialogue, the lack of optional English subtitles or captions may be disappointing to some. Not surprisingly, the plain-wrap interface includes just two options: "Play Movie" and "Chapter Selection". Loading time is fast with no trailers or advertisements beforehand, aside from the Olive Films logo. This one-disc package arrives with a promotional insert and attractive (but misleading) cover artwork. Unfortunately, no extras are included. Dark City isn't a genre classic, but the film serves up genuine suspense, terrific style, and a fine professional debut from Charlton Heston; supporting performances by Jack Webb and Harry Morgan (later paired in the '67 Dragnet series) are also a nice bonus. 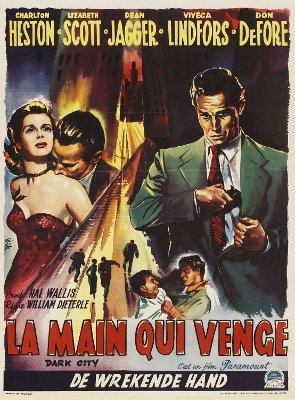 Unfortunately, there's some roadblocks along the way: the love triangle feels forced, the nightclub performances wear out their welcome quickly, and Dark City's strongest component----that is, the persistent dread of Sidney Winant's impending revenge---takes a back seat during several portions of the film's second half. Still, this is an entertaining diversion and worth tracking down for fans of the genre. Olive Films' Blu-ray is simply one-fourth of their previously released Film Noir Collection and a modest upgrade from their 2010 DVD...so this barebones disc has a slightly narrower appeal than expected, but it's still good enough to own. Mildly Recommended.